Q1. How to use factor command? Q2. What algorithm factor uses? If you are a Linux command line user, and your work revolves around prime numbers, there's a command line utility that might be of your help. The tool in question is factor, and in this tutorial, we will quickly discuss things like why it exists, how it works, and how you can use it. Please note that all examples and instructions mentioned here have been tested on Ubuntu 16.04LTS. line, read them from standard input. So that's how you can use the factor command. Of course, you can pass multiple numbers as argument to the command in one go. The tool doesn't offer any other major command line options, except the regular --help and --version that are there for almost every command line tool in Linux. primes), other methods are far better. an algorithm which is designed for factoring smaller numbers. Well, there's no official word on this, but experts speculate someone (or a group) dealing with prime numbers developed the tool over half a century back. And the fact that it has since been included in Unix and Linux distributions can be attributed to lack of any reason to not to do so. A discussion on this topic can be accessed here. Clearly, the factor command is a niche tool. Only those dealing with prime numbers/factors would find it useful. But then again, there's no harm learning about the utility (especially when there's practically no learning curve associated with it) and remembering it, as you never know, when it might save your day. 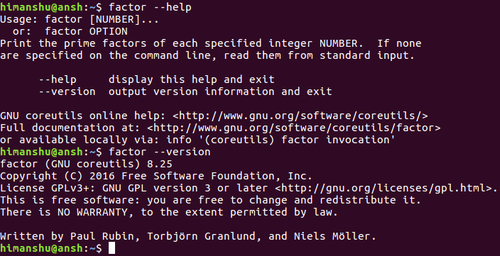 You can access factor's man page by heading here.